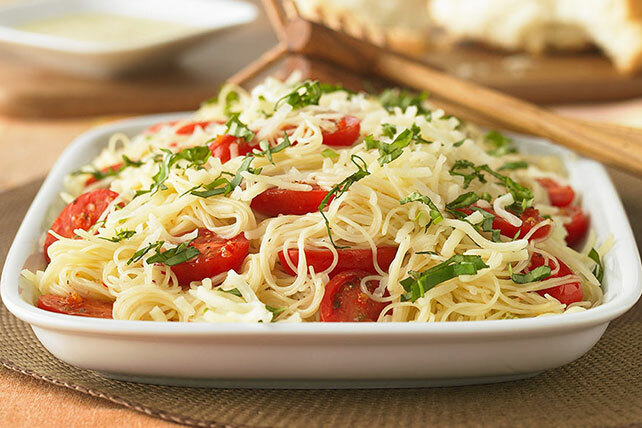 Give this Capellini Caprese dish its vibrant flavor with fresh tomatoes and basil. The Italian dressing on Capellini Caprese really makes it sing. Meanwhile, heat dressing in large nonstick skillet on medium-high heat. Add onions and garlic; cook and stir 2 min. Add tomatoes; cook 5 min. or until heated through, stirring occasionally. Prepare using cherry tomatoes, or substituting 3 chopped regular tomatoes for the halved grape tomatoes. Add 2 pkg. (6 oz. each) OSCAR MAYER Deli Fresh Grilled Chicken Breast with the tomatoes.